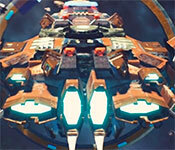 Redout: Space Assault is a 3d shooting game, you have to drive your Starfighter in space, complete a variety of missions, shoot down enemy fighters, and sink enemy super battleships. In each level, the player needs to complete the corresponding task in order to pass. The game's picture is very good, giving a movie-like feeling. The space is very realistic. If you have a super strong graphics card, you should not miss this game. The challenge and playability of the game is very strong, the difficulty is moderate, and it is not easy for you to stop playing. If you are a fan of flying shooting games, Redout: Space Assault is a very worthwhile game, join the wishlist now. Sign-up to get informed when the Redout series has new game released with BD Studio Games' FREE bi-weekly newsletter.